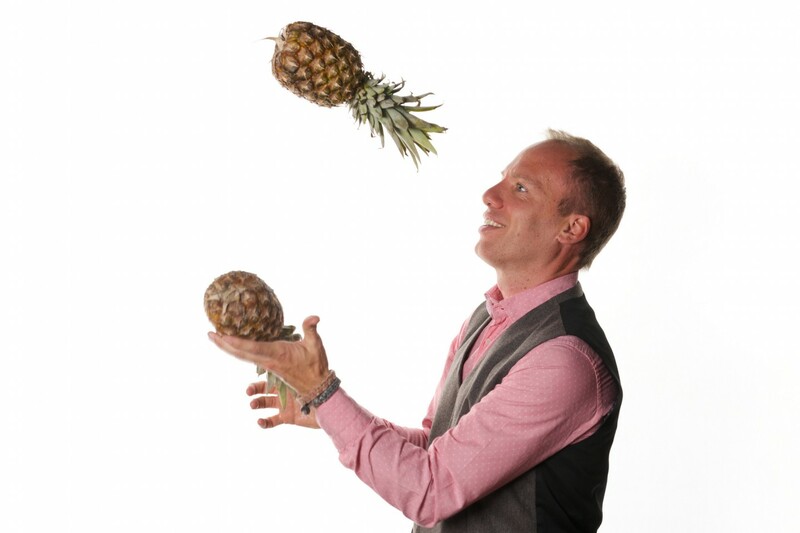 When Mark (pictured above, juggling pineapples) was 21 he went on a big adventure. He travelled the world for two years, getting lost in the rich colours, sounds and smells of Asia, Australasia and the Caribbean. He returned with vivid memories of remote villages, expansive beaches and magical moments when complete strangers invited him in to share their food, drink and stories. I love the stories of where we’ve been that central point in people’s lives. We know of customers who have met in our venues, who have then got married, who have then had kids. That is amazing to think there are kids wandering around now, who might not have arrived, had their parents not found this nice little corner that makes them feel good and special. I’ve told a bit of Mark’s story, partly because I’ve been working with him and I think you’ll enjoy his way of thinking. Watch him on what it’s like to work in the hospitality business, and why it’s important to have a packet of crayons on you or why craft beer is epic. I’ve also shared a bit of the Urban Guild story to show you how telling a bit of your story will help your business. And by a bit, I mean a bit. The last few paragraphs just took you 60 seconds to read, but the business benefits will last much longer. How sharing helps you. The three ‘c’s. clarity: to stand out more clearly in the mind of potential customers, stories about how you created and built your business will differentiate you from everyone else. And standing out in a sector like hospitality is hard. There are lots of other cafés and eateries out there vying with Mark. So if you also work in an industry where your customers are spoilt for choice, you need storylines that make your business vivid and memorable. credibility and the fact you care: if you share why your work is important to you, why it matters to (say) create settings and food which will be remembered years later, people will understand you really care about what you do. They’re more like to become, and stay, your customer. compelling: if your story is well told, with a beginning, middle and end; if your story clearly shows how your journey helps your customer to (say) have a lovely night out, then you will be doing your business justice when you talk or write about it. The food and drink sector is different to developing an app or software or something like that. You can to some extent get lucky if something takes off and explodes or whatever. But if you are feeding people or giving them drink or hospitality, you only survive if people come back again and again and again. It’s not a one-hit wonder. You have to be good all the time. I think some amazing people work in food and drink. They’re amazing because it is a very hard place to make a business and make money out of. So whether they are chocolatiers or gin companies or coffee shops, they tend to be passionate about what they do and they are fun people to work with. If you don’t have that passion, that personality, the consumer will see straight through it. They really will. I think you can fool people for a while, but you don’t have a long-term sustainable business if you don’t have that true passion. Go on. Watch Mark’s passion for yourself. And let me know if you’ve booked a table or a room at one of his places. About Miranda and picking cherries: Miranda uses her BBC background to interview the leaders of purpose-led businesses. As she explores their stories she (in Mark’s words) ‘zooms in and cherry picks the little nuggets of wisdom’. The nuggets help her interviewees to see why their businesses are special. Then, using her journalistic experience, Miranda shapes their stories, extracting the angles that will appeal to potential clients and win more business. The story behind your business values. Not sure what it is? Or what it’s worth? Read on. Vision and values are good things. The stories behind them are even better.